At the 1972 Summer Olympics in Munich (West Germany), Spitz was back to maintain his bid for the six gold medals. He did even more, winning seven Olympic gold medals. Further, Spitz set a new world record in each of the seven events (the 100 m freestyle [00:51:22], 200 m freestyle [01:52:78], 100 m butterfly [00:54:27], 200 m butterfly [02:00:70], 4 × 100 m freestyle relay [03:26:42], 4 x 200 m freestyle relay [07:35:78] and the 4 × 100 m medley relay [03:48:16]). 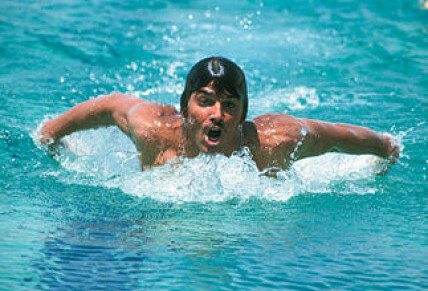 Originally Spitz was reluctant to swim the 100m freestyle fearing a less than gold medal finish. Minutes before the race he confessed on the pool deck to ABC's Donna de Varona, "I know I say I don't want to swim before every event but this time I'm serious. If I swim six and win six, I'll be a hero. If I swim seven and win six, I'll be a failure." Spitz won by half a stroke in a world-record 51.22. Spitz is one of five Olympians to win nine or more career gold medals: Larisa Latynina, Paavo Nurmi and Carl Lewis also have nine; only swimmer Michael Phelps has won more with 18. Spitz's record of seven gold medals in a single Olympics was not surpassed until Michael Phelps at the 2008 Beijing Olympics.